Beets and goat cheese are two of my favorite combinations. The beets get nice and tender from roasting and the crispy goat cheese is a nice contrast in texture. Enjoy alone or in your favorite salad. Preheat oven to 375. Rinse beets and trim off the beet greens. Wrap each beet in aluminum foil and pace on a baking sheet. Bake 45 minutes to an hour until beets are tender. Remove from foil and let cool slightly. Peel skin and slice. You can use gloves if you like so your hands do not get stained. Cut goat cheese in slices and dust with flour. Dip slices in beaten egg and dredge in panko. When all pieces are coated, let chill for 30 minutes. To cook, heat ¼ inch oil in a pan. Fry goat cheese about 2 minutes on each side until golden brown. Drain and paper towel. Combine honey and balsamic vinegar in a small saucepan. Simmer for 10 minutes. Sauce will reduce and thicken. If you make this a head of time, slowly re heat in pan or transfer to a microwave safe dish and heat for a few seconds. If you are having trouble cleaning your pan with the glaze, just add water to the pan and heat until the glaze is dissolved. 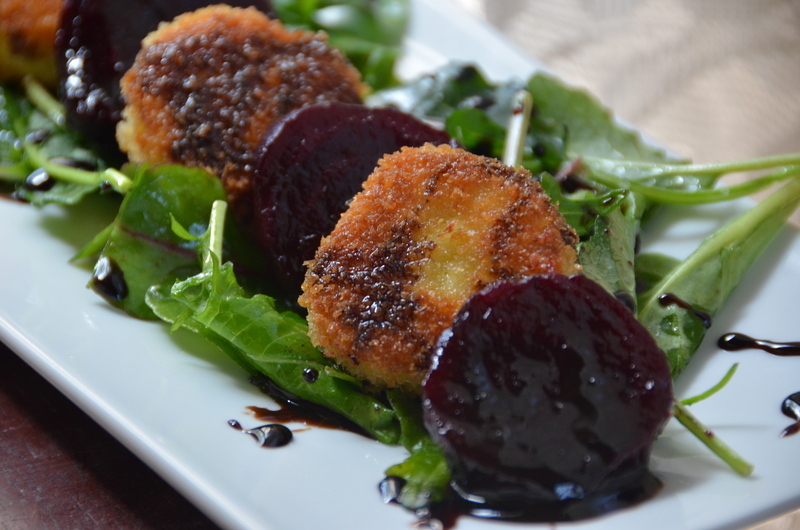 Beets and goat cheese can be eaten alone drizzled with balsamic glaze. It’s also great over mixed greens dressed simply with a little olive oil and lemon juice topped with a little of the balsamic glaze. This is the kind of recipe that makes me miss cheese. Lovely and great photo. I make this at least once a week- I use coconut oil to fry the goat cheese, it is SOOO good! I definitely have to try with coconut oil the next time!